SIZE: Measured flat 6 X 3.75 across. Cast on 48. Place marker, join and arrange on 3 needles (18, 12, 18) being careful not to twist. Knit until bag measures 3 inches from cast on edge. 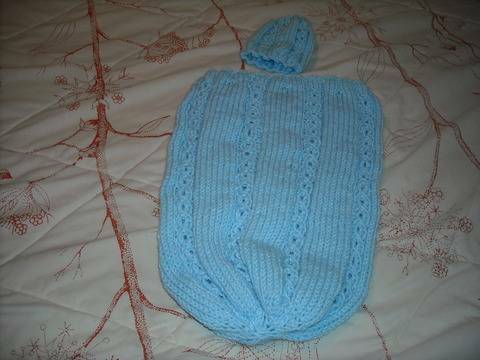 Knit until bag measures 4 inches from cast on edge. 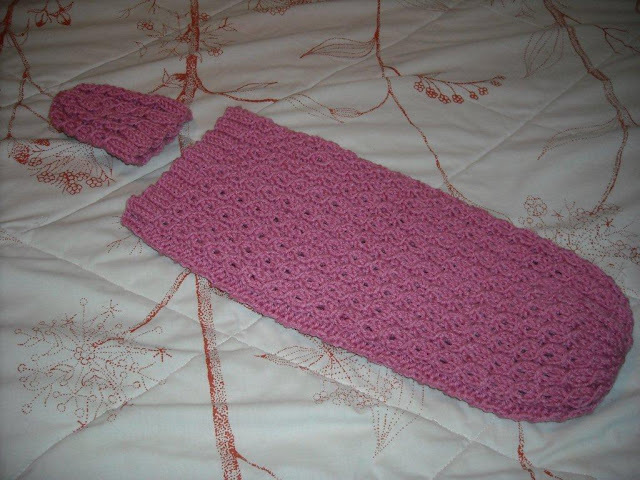 Knit until bag measures 5 inches from cast on edge. Cut the yarn leaving a 6-7 inch tail. With the tapestry needle run the tail through the remaining 8 stitches twice. Pull tight. With crochet thread and D hook, chain at least 12 inches, this is just a minimum length you can make it as long as you want. Weave the cord in and out of the eyelet holes. String a bead on each tail and push up far enough to tie a knot near the end of the chain. Trim tail and bring bead down to knot. Virginia knits, crochets, tats and about any other fancy work you can name. She makes most of her things for various charities that are close to her heart. Cast on 100 stitches, and careful to not twist sts, join. Place marker on needle. Work *K3, P2, ribbing around to marker for one inch. Round 1: * sl 1, K2, psso, P2, repeat from * around to marker. Round 2: * K1, YO, K1, P2, repeat from* around to marker. Round 3: *K3, P2, repeat from * around. Cut yarn leaving a tail long enough to thread through needle and put through the remaining stitches. Pull tight and finish off. Work in K3, P2 ribbing for 1 inch. Work in pattern stitch until piece measures 5 inches, ending with round 1. Cut yarn with long tail and finish like above. This takes about 7 ounces of worsted weight yarn, I used Mainstay that I had in my stash. Round 1: *sl 1,K2, psso, P2, K8, P2, repeat from * around to marker. Round 2: *K1, YO, K1, P2, K8, P2, repeat from * around to marker. Rounds 3 & 4: *K3, P2, K8, P2, repeat from * around to marker. Work 5 rounds of K3, P2, ribbing. About 19 inches, ending with round 1. Decrease rounds as follows: Switch to DP needles when needed. Cut yarn leaving a tail long enough to thread through needle and run though the remaining sts on the knitting needle, pull up tight and finish off. Hide ends of yarn and you are done. This pattern can be made using more or less rounds of ribbing as you like. Round1: *sl 1, K2, psso, P2, K5, P2, repeat from * around to marker. Round 2: * K1, YO, K1, P2, K5, P2, repeat from* around to marker. Rounds 3 & 4: * K3, P2, K5, P2. Repeat these 4 rounds of pattern until total length is 5-5 ½ inches, ending with round 1. Cut yarn leaving a long enough tail to thread needle and pull through stitches remaining on knitting needle. Pull up tight , finish off and hide ends.